To peel tamarillos, blanch in boiling water 1 minute, then place in bowl of ice water. The skin will come off easily. 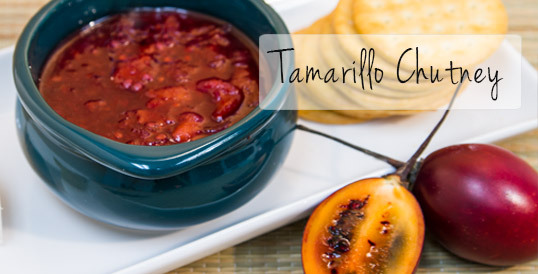 Roughly chop peeled tamarillos and put in heavy-based saucepan with all ingredients. Stir to dissolve sugar and bring to boil. Simmer, stirring regularly, until chutney thickens, about 30 minutes. Adjust seasoning to taste. Chutney can be kept in the refrigerator for up to one week. For longer storage time, please follow safe canning instructions outlined on FoodSafety.gov. Serve chutney with soft cheese and crackers or with a meat dish like roast pork.